At The Crystal Palace in Magic Kingdom you'll find several salad options on the buffet. One of them is edamame salad made with young soybeans. Cook soybeans for 5 minutes in boiling salted water until they are cooked through. Chill completely. Mix Sriacha Chile Sauce and Mandarin Ginger dressing together. 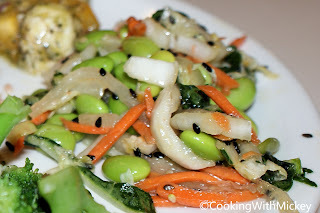 Mix remaining ingredients, soybeans and dressing together. Season with kosher salt.